Toronto came to Philadelphia with an offense in tow widely regarded as one of the best in baseball. It showed its potency on Sunday at Citizens Bank Park, capitalizing on a trio of walks to down the Phillies, 5-3. Of the Blue Jays five runs, three reached base via a walk. The Phillies offense sputtered early, finally piecing together an offensive threat in the sixth when Maikel Franco, Carlos Santana, Aaron Altherr, and Nick Williams belted consecutive singles to score three to bring the Phillies to within a run, but that's as close as they would come. Of the Phillies six hits on the afternoon, four came in the sixth inning. Nick Pivetta got himself into trouble in the second, surrendering back-to-back walks along with an errant pickoff throw before Devon Travis cleared the bases with a double to left to give the Blue Jays a 2-0 lead. Pivetta finished the afternoon having tossed just five innings. He surrendered two runs on four hits and struck out seven. "He did a really nice job, despite not having his best command and falling behind from time to time," Phillies manager Gabe Kapler said. "He really battled for us and gave us a chance to win the game. We would have liked to see him spend a little more time on the mound, unfortunately we got to that place in the game where we had to score a run or two and we had to hit for him." The Blue Jays multiplied their lead in the sixth, scoring a pair of runs off Tommy Hunter with Dwight Smith delivering a two-out double down the left field line. Curtis Granderson hit a solo homer in the ninth off Hector Neris as insurance. Rhys Hoskins finished the contest 0-for-4, his batting average dipping to .234 on the season. He hit a ball to deep left in the eighth, but came away with nothing to show for it. Other managers may think of giving a day off to a struggling young slugger or moving him somewhere else in the lineup, but not Kapler. Not right now, at least. "I think this is perfect time to get him rolling," Kapler said of Hoskins. "We have a road trip here against some really good baseball teams. The Dodgers, despite the fact their not off to their best start, are an explosive offensive club with some really deep pitching. We know how good the Cubs are and we saw the Giants, so that's three good clubs and the ideal time for Rhys to get going. There's been some signs and flashes that lead us to believe he's really close." The Braves beat the Red Sox at Fenway Park on Sunday afternoon, meaning Atlanta leapfrogged Philadelphia to take a half-game lead in the NL East. The Phillies embark on a 10-game road trip that opens Monday with a four-game set against the Dodgers in Los Angeles. The trip also includes a stop in San Francisco before ending with a three-game series with the Cubs at Wrigley Field. "We're looking to compete," said Nick Williams. "Play hard and battle, that's all you can do. I know these teams are good, but it's going to be an interesting challenge. We're going to compete." Despite his fielding mishaps of late, Carlos Santana has turned things around after a horrid start to the season. He's hitting .288 with four doubles, a triple, seven home runs, and 21 RBI over his last 20 games. This all after opening the year with a .151 batting average through the first week of May. 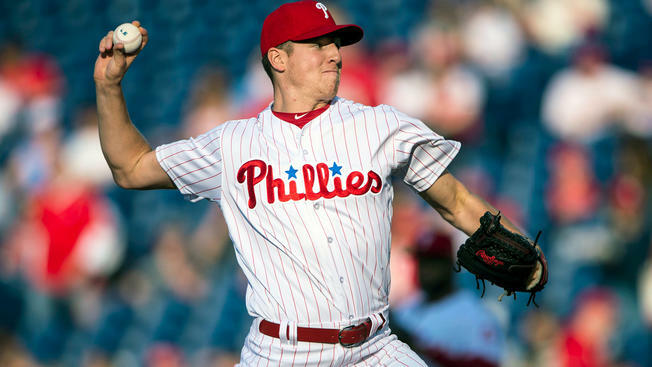 Vince Velasquez will be on the hill Monday for the Phillies as they open a four-game set with the Dodgers. The Dodgers counter with righty Brock Stewart.